The index opened strong at 8770 but some profit booking towards 8745 but closed strong near the highs of the day at 8769.15, gain of 31.05 points. The broader market was positive with 941 advances to 675 declines. Range stays at 8500-9000. 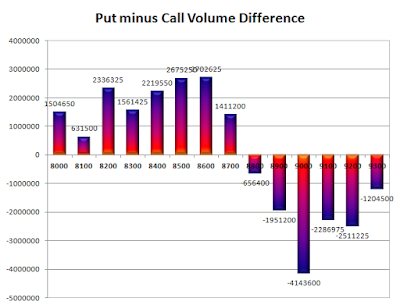 Call option 8800, 9000-9300 added 12.02 lacs OI with short covering at 8600 and below strike prices. Put option 8800-8000 added 23.70 lacs OI. 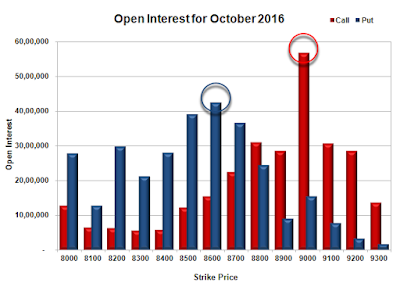 Nifty Open Interest is at 2,21,95,500 up by 2,02,950 with increase in price, probably long build-up. Bank Nifty Open Interest is at 19,33,600 up by 24,120 with increase in price, probably long build-up. 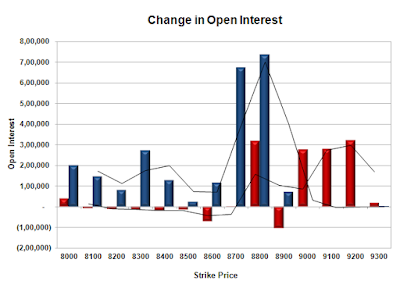 FII’s bought 5038 contracts of Index Futures, which includes net 7683 contracts long build-up and 2645 contracts short build-up, with increase in net OI by 10328 contracts, includes 42208 longs to 37170 shorts for the day. FII’s Index future open contract as on date is 229554 Longs to 38042 Shorts, Net long 191512 contracts. Initial support at 8700 with OI of 36.64 lacs and below that at 8600 with OI of 42.42 lacs. Initial resistance at 8800 with OI of 30.99 lacs and above that at 8900 with OI of 28.51 lacs. Day Range as per Option Table is 8694 - 8836 and as per VIX is 8700 - 8838 with 8763 as the Pivot.